A new multi-channel field tester specifically designed for measuring the intensity or Red, Yellow and Green LED traffic signal light modules as set forth in ITE Interim Purchase Specifications for LED, section 4-4.3 Photometric Maintenance. 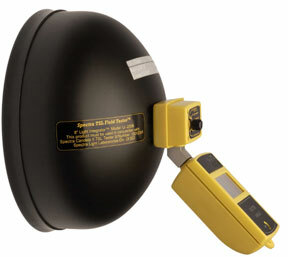 Spectra Candela III Model Photometer/ Radiometer. 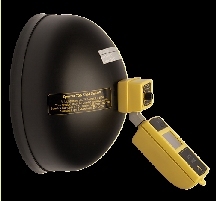 The Model TSL-2000 system is a versatile, precision, portable Photometer/Radiometer that can be used to measure illuminance, luminance, irradiance, radiance and many other special parameters. This instrument can be custom configured for your application. There are up to 12 independent channels available, six channels can be utilized for incident (illuminance) and the other six channels can be for reflected (luminance) light measurement. CR- 2000: Cosine Receptor is specially designed for Cosine-corrected illuminance/irradiance measurements. Specially designed white molded plastic diffuser receptor, the diffuser provides cosine correction to a high degree of refinements; thus detector correctly evaluates the light intensity regardless of the direction. LI-20008 & LI-20012: 8" (200mm) and 12 inches (300mm) Light integratorTM is designed to measure LED intensity in order to keep track of LED degradation of the traffic signal light. Geometrically shaped design made of molded hard plastic at the inner side attaches a large hemispherical shaped SpectraSphereTM assembly which simulates a three dimensional subject and it integrates or averages the effect of all the LED's intensity and weighs them proportionally. The outer side of the Light IntegratorTM fits flush against or totally covers the traffic signal light to be measured. LA-2000-14: Luminance AdapterTM modifies the angular response of the Candela II to 140 (1"dia) it is designed and calibrated to measure the surface luminance and radiance of LED clusters, back-lit sources or CRTs. 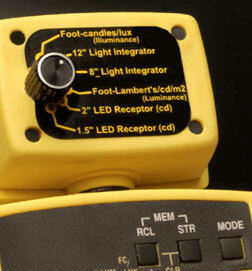 It measures directly in foot-lamberts (multiply foot-lamberts times 3.426 are equal to cd/m2). It is well suited for measurement of lane control arrow symbol. lane control X symbol. 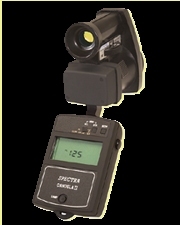 SA-2000-1: Spot Attachment is a unique optical accessory that converts the Spectra Candela II into a high sensitivity 20 (50) Spotmeter for narrow angle reflected-light measurements. 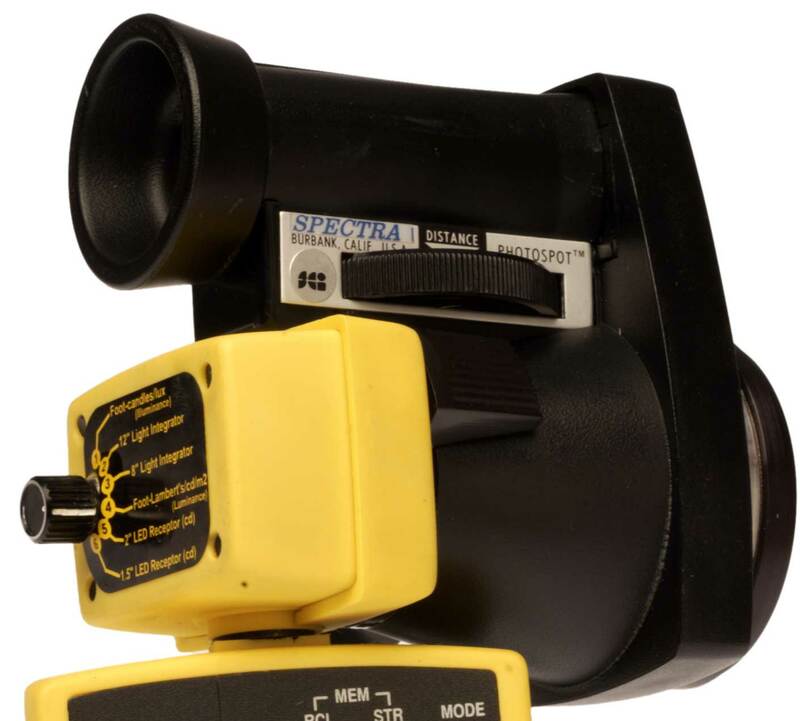 The Spot attachment enables you to make accurate luminance measurements of distant subjects particularly useful for making accurate subject contrast or ratio measurement. 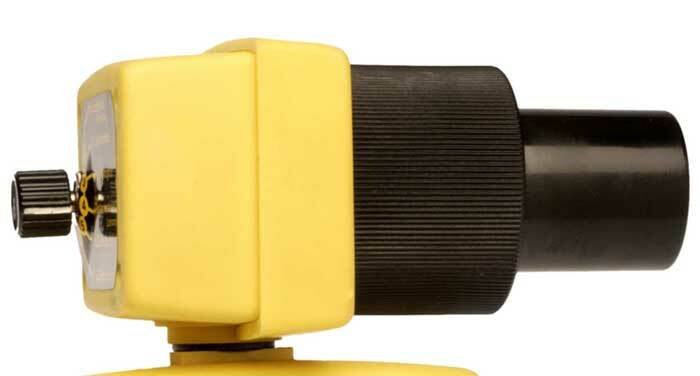 The Spot Attachment features a bright, erect, wide-field (120), life-size optical system. A sharp reticle in the eyepiece accurately defines 20 or 50 measuring field. LR-2008 (4",2",1.5",205") LED ReceptorsTM are accessories calibrated for LED and LED cluster measurement of axial luminous intensity (candlepower). The unit of measure is also called "candela". 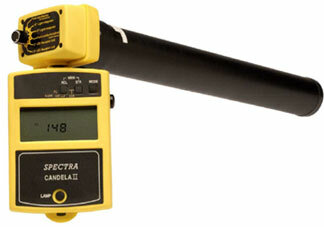 The full-scale sensitivity range of the Spectra Candela II with LR-2008 is 10-1 to 105 candelas. The Receptor consists of a 12-inch long black aluminum anodized tube with an LED (LED cluster measurement) port on one end and a hemispherical shaped diffuser at the other end. The diffuser end attaches to the front of the Candela II's detector head assembly. Other adapters can be provided for specific custom configuration.